We are all aware of the fact that in order to be first, we should always keep up with modern tendencies since they define core factors which impact on our success. Swissuplabs Ajax Layered Navigation Magento 2 Extension is a tool which is to be applied when you long for positive changes in your e-commerce business. The module is designed to simplify the life of your customers by improving your website navigation and the overall user experience of your webstore. To do so, the Magento extension utilizes Ajax, which, basically, is a powerful technique to eliminate page reload, thus creating a more comfortable environment for your website users. 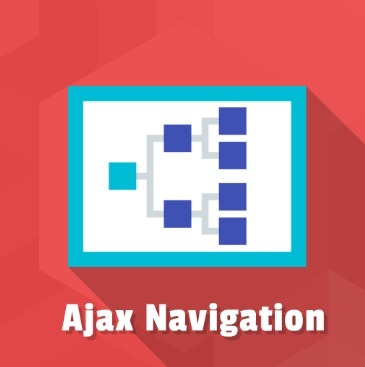 Provided your website counts a huge number of product attributes, the application of such ajax based layered navigation module is required. With its assistance, you are able simplify the navigation system of your store, by offering your clients product as well as attributes filters. As a result, it becomes way much easier for customers to find items they are willing to buy. And you also benefit from it. The simpler it is to find a product, the more probable it is that website visitors make up their mind to make a purchase on your e-commerce website. Application of layered navigation with filterable attributes. 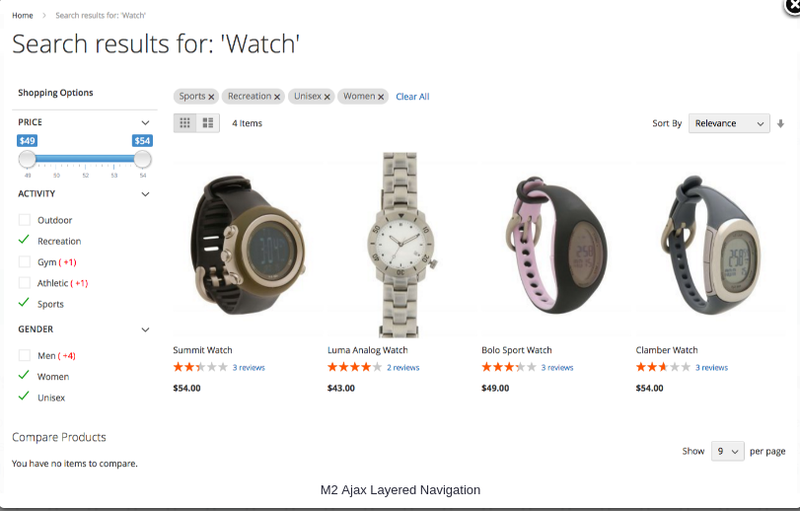 With this Magento 2 extension, you are able to apply the ajax layered navigation technique on search result as well as catalog pages. Consequently, you let your website users specify what they are searching for by giving them the opportunity to use filters. As the matter of fact, the problem of bad navigation is quite wide-known, therefore, having installed the tool, you can avoid it and considerably simplify the searching process. As a result, it does not take either much time or effort for your clients to find the item they are looking for. In fact, the key feature of Ajax technique is the elimination of page reloads when customers look for items. With its assistance, the majority of all navigation actions take place on frontend with no need to reload the page. Consequently, you are able to offer a better functioning navigation system to your customers and engage them in a comfortable environment to make purchases in your webstore. Apart from improving the overall website navigation, the module provides your clients with a Magento price slider. By means of applying this instrument, you allow your customer to find products that correspond to their budget, which, in its turn, again accelerated the searching process. Moreover, the slider looks pretty attractive and engaging. However, in the backend of the module, you also are able to configure its appearance. When e-commerce websites have such a feature, they are perceived as progressive webstores, whose aim is to optimize user experience. We should never forget that we live in a world in which almost everyone has a smartphone or any other mobile device. Therefore, the Magento ajax layered navigation module has taken it into account to provide maximum comfort for mobile users as well. As a result, you are able to increase your sales, simply because this category of website users is satisfied and can take full advantage of the features the extension provides in your webstore. On the picture below, you can observe how a search result page looks like. At the side panel, your customers are able to specify different attribute filters. The price slider will help them find products they can afford in a quicker manner. Whenever your clients add/remove a filter, the page automatically updates without reloading. Apart from it, it is possible to sort products by relevance, price, position, etc. Thus, you do optimize and accelerate the searching process. 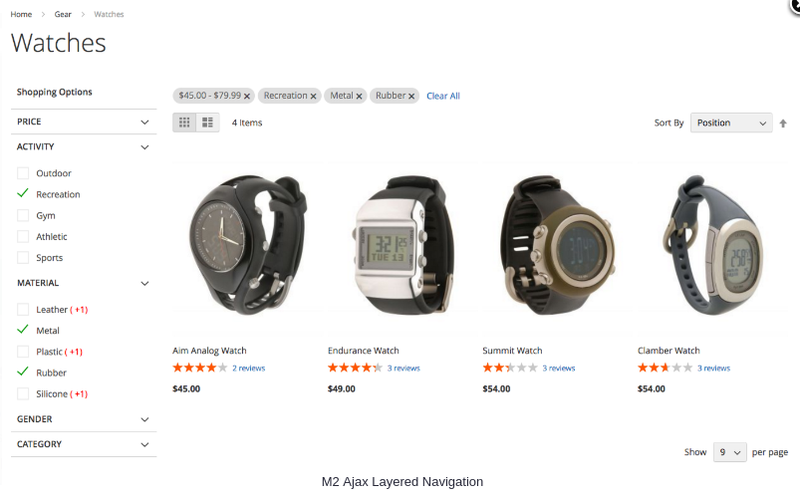 And this is how a catalogue page appears when you click on a certain category of items. As you see, it is absolutely the same as the search result page. Your customers are able to hide some attribute filters (price for instance) in case they do not need it. And again, this ajax based layered navigation will let your website users search for products without page reload, providing a more convenient manner to make purchases. The application of new techniques is inevitable, of course, if you are longing for a successful business. Such small details, in fact, do make a great contribution to an appropriate e-commerce website management. Therefore, we recommend you to apply such tools to be able to optimize the overall customer experience on your website. Moreover, the tool costs $79, which is literally nothing, when it comes to creating a favorable environment, in which your sales grow. In case, you have some questions or comments, please share it with the company which developed the tool for them to make it even better.